RAPID-N features an integrated context-sensitive help system to guide the users in performing system-related tasks. The help contents are stored in the database as separate help records. For each record type and task, a specific help content can be specified by using the "help" attribute of the task definitions in the record forms. ID or alias in the base (system) language of the related help record should be set as the value of the help attribute. The system displays a help icon next to the main heading in the task pages for which the help content is defined. If the user clicks the help icon, a pop-up dialog contain-ing the help content is shown (Figure 1). Form elements also support context sensitive help. Similar to the task pages the "help" attribute should be set to enable help support. Data fields of the help records are listed in Table 1. For each help record, a multilingual title should be specified. The system supports two types of help contents: wiki and code. 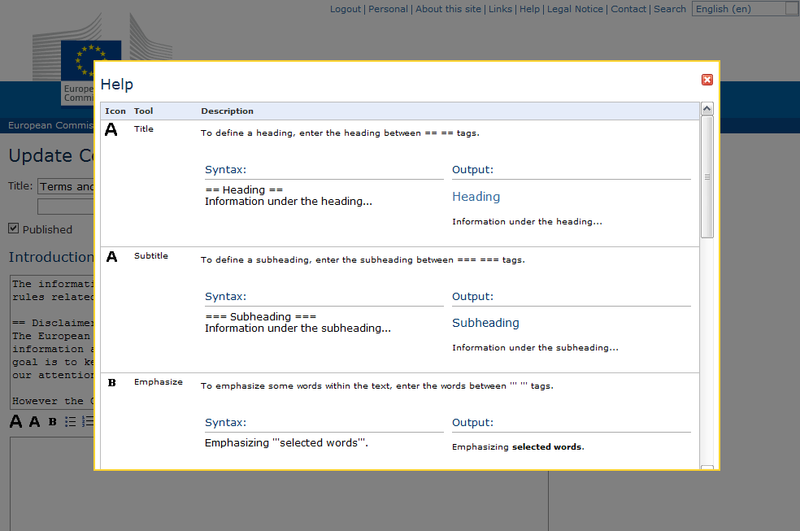 Wiki-based help contents are basic contents, which can be written by using wiki tags supported by the system. They support multilingual content. Code-based help contents are ad-vanced contents, which allow the administrators to use the server-side function library provided by the system to enrich the help content. Multilingual aspects of the help content should be solved within the source code for such help contents.